How does Monday always do that? No matter how much I prepare myself: organized to-do list in place, iron-clad schedule, outfit planned to the last detail, alarm clock at the ready…it always seems to expertly side-swipe me, coming at me like some devilish linebacker and knocking me off my feet. After which it proceeds to dump wave after wave of work and little surprises on me that I had sworn I was prepped for. But no. Monday is just too wily for me. I can rule the world on Tuesday to Sunday, but never on a Monday. Which is another occasion when leftovers can save the day. A little smorgasbord of leftovers gathered from the weekend gives me peace of mind that I don’t have to cook on Monday night. As I go through the rigors of a Monday, sweating and swearing (yeah, I do that, surprise) and hoping to get everything done, I can breathe a wee bit easier knowing that I’ve got containers of food ready for dinner. Or at least dinner with minimal preparation. Yesterday we had brilliant leftovers from the Nigerian food, made by our friend M, for a Saturday night dinner at our flat. Jollof Rice and okra stew (same lovely friend as here). C adores both dishes so M made lots extra so he would have leftovers. We had them yesterday after a round of (ick) gym. Between work and gym, at least dinner was one thing I didn’t have to fret about. No photos of that since I don’t take food pictures after dark (my “lighting” is off-duty at night) but here is the last 0.5 of our roasted pork belly (see the first round of pork belly leftovers here) that did wonderfully as a hasty lunch. Pork belly…good to the very last! No recipe as this is so simple to make and consists of things pulled together from what you’ve got around the kitchen. This is perfect if you have leftovers from a pork belly you’ve roasted flat, so you get these slices that look like meaty bacon. Don’t slice them too thin! You can slice them the night before so they are ready to go whenever you are. Here’s what I did: Figure about 3-4 slices of belly per person. Straight from the fridge, fry pork belly slices in a pan with just a little oil until heated through, golden, and the rind’s a bit toasty. Toast a slice or two of bread per person (depends if you want an open or closed sandwich). Spread one side of bread with a grainy mustard. Top with rocket leaves. Top with the fried pork belly. Top with chutney (I used my spiced apple chutney) and spread. Top with the second slice of bread or leave open. 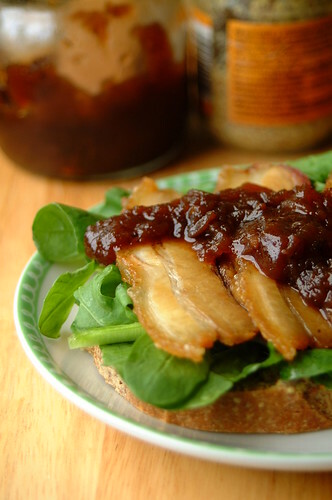 The pork belly served us well – 2.5 meals for less than the price of one steak! A successful study in leftovers that helped us avoid food waste and saved us some cash to boot. Planning your meals – when you have a solid outline of what you’ll be eating during the week you are less likely to go wild at the market and buy things that will eventually taunt you as it rots. Sharing is caring! – The most fun way to enjoy extra food…have friends over! If you’d like to share your own tips for avoiding food waste please do! I’m sure we could all use some help 🙂 And maybe I’ll pick one to do in a future post! Meanwhile, let weekend leftovers save you a bit of Monday stress! It worked for me 🙂 All I can say now is…thank God it’s Tuesday!